← Wages of Wins Podcast – Eric Weiss on a different type of advanced stat. Recently I’ve been taking a look at NBA attendance and ticket prices. I decided to combine this data with the Total Personal Income (TPI) data Arturo used for his famous post on NFL, NBA, MLB, NHL, and MLS expansion candidates. When you put all of that together, you can get an idea of how NBA franchises perform compared to their market size. Today I’m just going to focus on the positive: which NBA teams are out-performing their expected ticket revenues? These three teams are in the bottom ten NBA markets in terms of market size, and they perform just about as we’d expect given their respective sizes. Orlando punched above its weight for the past couple of seasons, but after Dwight Howard was traded to the Lakers, the team has suffered the second largest drop in nightly ticket revenue between this season and the last. The Bucks are just doing what they do best and remain consistently average. And despite suffering the largest drop in ticket revenue over the past three seasons, the Cavs are still in positive territory. The Suns’ decline on the court has really made an impact on ticket revenues; the team has suffered the second largest decline in ticket revenue over the last three years. But like the Cavs, even though the playoffs are a distant dream and the team’s saviour (Steve Nash, in this case) is gone, the Suns are still doing okay. The Mavericks are still doing well, despite some on-court slippage; the Mavs’ ticket revenue has increased (slightly) in each of the last three seasons. The Jazz and the Thunder are very similar when it comes to ticket revenues: they are the smallest NBA markets, haven’t seen much of a change in their ticket revenue over the past three seasons, and perform a good deal better than they should given their market size. On the other hand, the Nuggets are an average sized NBA market whose success this year is mostly due to having the third largest increase in nightly ticket revenue between this season and the last. The Knicks play in an absolutely huge market, and as such, we should expect them to make a pile of money off of ticket sales. In the 2010-11 season, the Knicks were making a huge pile of money, but that pile was about as large as we would expect based on their market size. However, that season the Knicks put an improved product on the court and made the playoffs. As a consequence, the team saw a huge jump in ticket revenue in the following season. While this jump was not replicated this season, the Knicks have still had the largest increase in ticket revenue over the last three seasons. Portland is an average sized NBA market, but its fans are notoriously dedicated. The team has had a couple of tough seasons and has suffered the 6th largest drop in nightly ticket revenue over the last three years. Even still, Blazers’ fans have kept this team in the top six. Chicago is the third biggest market in the NBA, behind New York City and Los Angeles. A couple of very successful years on the court have translated into the 5th largest ticket revenue increase over the past three seasons, and even though the team’s record isn’t as good this year, ticket revenues are still going up. Not many people will be surprised with the top four teams on this list, including the Celtics. Boston is a largish NBA market, but the team has a storied history and has had several very successful seasons in recent years. While the season-to-season increases have not been very large, the nightly ticket revenue is already far above what we would expect for a Boston-sized market. With the careers of Kevin Garnett and Paul Pierce winding up, the Celtics have a very nice cushion to fall back on should the on-court product suffer over the next couple of seasons. The Lakers manage to one-up their old rivals once again. Los Angeles is the NBA’s second largest market, but the Lakers history, star players, and celebrity fans help push this franchise into the top three. While they have a nice margin, the Lakers might want to watch out for the Clippers, who are closing the L.A. gap very quickly. San Antonio is the 9th smallest NBA market, but somehow manages to earn the 7th largest nightly ticket revenue in the league. This shouldn’t really be a surprise, as the Spurs have put together a ridiculous 24-year run where they’ve won over 67% of their regular season games (1286-622), won four NBA championships, and made four additional Western conference finals appearances. Led by stars like David Robinson, Dennis Rodman, Manu Ginobili, Tony Parker, and Tim Duncan on the court, and Greg Popovich off the court, the Spurs have rewarded fans for over two decades. In turn, the fans have rewarded the San Antonio Spurs. Were you expecting anything less from the Heat? Last year’s champs have had two consecutive seasons of good ticket revenue growth, leading to the 4th largest increase over the past three seasons. Winning will do that for a franchise. Having the best player in the league and winning 27 games in a row doesn’t hurt either. Total Personal Income (TPI) data came from the US Department of Commerce (for US markets) and OnNumbers estimates for Toronto. Total personal income is defined as “the sum of all money earned by all residents of an area in a given year”. 7 Responses to "The best NBA markets of 2012-13"
So expected ticket revenue per game is the predicted value of the regression “Ticket Revenue per game = constant + B’TPI”? Or am I missing something? I know this is not supposed to be rigorous analysis (although the results presented are very clear, so kudos), but I would be interested in adding more variables for predicting Ticket Revenue per game. Population, a cost of living index, quality of team, and a proxy for entertainment options (examples: other sports teams, night clubs, % of income spent on entertainment) are the obvious variables I would put in. By controlling for these, you can refine/reformulate the question to see what owners perform better than others or who has the most “diehard” fans in a city. 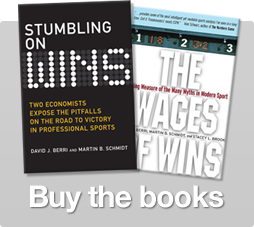 Sports economics combined with real economics… love it! Seems like a polynomial curve would fit better than a linear trendline. A linear trendline assumes a city with a TPI of $0 could generate $618K per game, better than nine NBA cities. Theoretically, an NBA team located away from any city should still be able to draw some ticket revenue (so I’m not saying you need to set your intercept to zero), but not better than nine NBA cities. A polynomial curve would make San Antonio the number one market, which makes sense when you consider they make 74% of the ticket revenue of Miami (per game) with only 32% of the TPI. Ticket price seems to be the big factor here, with the markets above expectation charging more than $60 on average and the below average markets charging less than $40. Ticket price is more correlated to a city’s TPI (67%) than winning reputation (~50%), although both play a factor. It would be interesting to see how San Antonio’s TPI has increased over the past few decades versus the other NBA cities and the national average, to try to get an idea of what a healthy NBA franchise means to a city’s economy. I know you don’t come up with the numbers but TPI is misleading. Large metro areas like MIA (dade, fll, ect), dallas (fort worth, arlington), ny (5 boroughs), chi (chicagoland), lax should not be made “whole” as they are currently represented. Such a smaller percentage of these large metros can actually make the regular trek to the game. Which is especially true for weekday catered leagues. Basically am saying, if you are 50kms (30 miles) away from the arena in Orlando, you are more likely to go to a Tuesday night game than if someone were the same distance away from the staples centre in LA. The one flaw with your model is it does not take tourism into account. I am a Miami Heat season ticket holder and almost every game I sit next tourists coming to see the Heat play. Miami is packed from January to May with wealthy visitors from around the world and these people gladly pay top dollar to see Lebron play. I would guess that Miami, Orlando, NY, and LA generate plenty of extra ticket income from tourists. Cleveland, Detroit, Minnesota, and other cold weather rust belt cities don’t have these extra fans. I have read that Las Vegas would be a great NBA destination because the casinos will buy up the tickets and offer them as perks to their guests. Maybe the model should add average tourists from November to April to account for this. Yes, exactly. And I’d love to add in more variables, but that would require a lot of work (to find out which variables add explanatory power, etc). Another good point; however it would take a lot more analysis to solve that issue. Basically you’d have to determine how long (in terms of time) 95% of fans are willing spend to get to a game, then use maps and transit data to estimate the boundaries of that area, then you’d have to re-calculate TPI…it would be a mess. There’s another variable that might be important — we’d have to check, but I suspect you’re right. I’m not sure Rodman’s brief stay in San Antonio qualifies him to appear on a list of the 6 players who contributed most to the Spurs’ popularity. I know he produced wins, but he was not very popular with the fansbase. Even limiting the argument to measurables — as his stay in SA was brief (2 seasons) I doubt he’s among the Spurs’ top 6 wins producers. I am sure he would be if his years in Detroit and Chicago counted.